Baruch Marzel of Hevron is number 4 on Ha'am Itanu's list, and one story going around explains how he's viewed in his hometown. 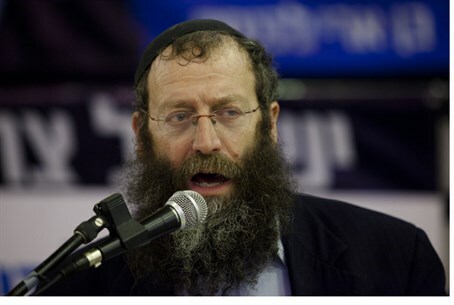 With the entry of Hevron loyalist and activist Baruch Marzel into the Knesset election race, a story of his "correct" relations with his Arab neighbors in Hevron has been making the rounds. Marzel's daughter Racheli, 16 years old at the time of the story, had lost her cell phone. As is customary, she dialed the number to see if it would be answered, and possibly the phone could be recovered. In this case, however, an Arab man answered the line, and explained that he would be glad to return the phone – for a payment of 1,000 shekels (over $250). The young owner, who grew up in a house where "fear of Arabs" was not readily tolerated, reportedly shot back, "I wouldn't give you money even if you cleaned my house for a month!" She then added the kicker: "I'll just let my father, Baruch Marzel, take care of this." At this point, the "finder" changed his tune. Though Racheli had hung up, he called her back several times, offering to return the phone free of charge. "I don't want any trouble with Marzel," he reportedly said. "He's like your Sheikh. I don't want any money, I'll return the phone to where I found it, just take it! I don't want a curse on me!" Young Ms. Marzel was not impressed, and hung up. Finally, in desperation, the Arab brought the phone in person to the Hevron police station, saying he had found it. The police were so surprised – they later said that it had never happened before that an Arab had returned a lost phone – that they suspected that the phone had been booby-trapped – and they detonated it in a controlled explosion. No explosives had been placed in the phone. Baruch Marzel himself had a simple explanation for what happened: "This just shows that the Arabs of Hevron respect those who stand up for themselves, and they scorn those who are weak. We in Hevron live amongst a large Arab majority without fences and without protection – the Arabs respect our strong stand, but look down on the leftists who come to pander to them." Baruch Marzel is number four on the party list of Eli Yishai (Yachad - Ha'am Itanu). He has run for Knesset in the past, but did not succeed. He gave up a fair chance for a seat two elections ago when he allowed Dr. Michael Ben-Ari – considered by some as less "extreme" – to take his place on the National Union party list. Ben-Ari returned the favor just last week when, apparently considered too "extreme" by Eli Yishai, he agreed to have Marzel run instead of him. Most surveys show that Yishai's party will earn enough votes, with the help of Marzel's die-hard supporters, for Marzel to enter the Knesset.